Organize projects, manage finances and build a better way to do business with tools from Microsoft Office Professional 2010. Exchange ideas with customers and business partners remotely with Web Apps--it's another way you can stay connected to your business wherever you are. Plus, build professional databases and marketing materials with dynamic do-it-yourself tools in Access 2010 and Publisher 2010 available ONLY with Office Professional 2010. 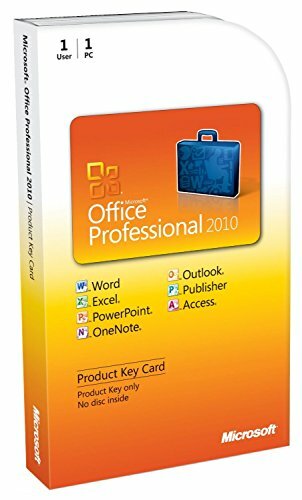 Key Card Version About Microsoft Office 2010 Product Key Cards A Product Key Card provides another way to purchase Office with a PC. It includes a 25-character Product Key designed to activate Office software on a preloaded PC. Product Key Card features Includes 25-character Product Key only, no disc. Designed to activate Office on 1 PC preloaded with Office 2010 suites. For a limited time, customers buying a PC without Office 2010 preloaded, can download the software at www.office.com/productkeycard. Licensed for 1 install on single PC only. License cannot be transferred to another PC. Download backup available at www.office.com/productkeycard. Recommended for: Customers buying a PC who need Office for new PC only; don't need to upgrade other home PCs. Customers buying a PC who don't require DVD media and/or are okay downloading software (if Office not preloaded). Customers buying a new PC (best experience if customer simply uses the Product Key to activate a PC already preloaded with Office 2010 suites) For customers who require Microsoft Office Professional 2010 with a license for two machines (primary and portable PC), Office may be purchased in a traditional disc version.